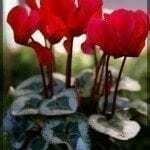 I had a cyclamen with large flowers and ruffled leaves. What is it called and if you know, where can I get another one? There are about 20 species within the genus of Cyclamen.